Do you have a loved one in a nursing home? Surprise and delight them by sponsoring a Magic Ministry program for the facility! 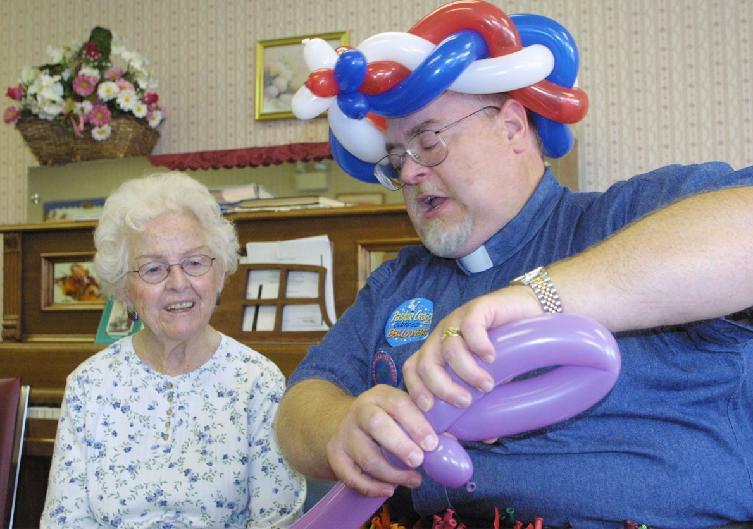 The Vacation Bible School at Trinity Lutheran Church in Codorus, PA sponsored a 45 minute Magic Program at the Manor Care Nursing Center in Kingston, PA.
One family provided a program as a memorial to a loved one who had been active in a community Senior Citizens' center. Another family provided a program at a state park campground worship service as a memorial to a loved one. At the begining and end of the show, Rev. Lantz informs the audience who provided the show for them and who the program honors if that is applicable. A sponsored show is a great birthday or anniversary present for someone in a nursing home, rehab facility, Sunday School or congregation!